Image © Stuart Moore, Alberto Ponticelli and Ahoy Comics. 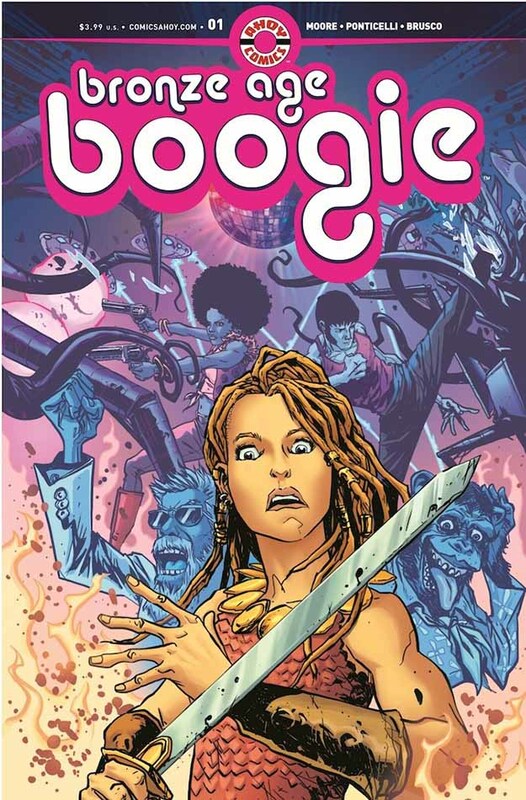 The latest new title from Ahoy Comics (with a handsome logo by Brett Evans) is an unexpected mix of times and genres. The “Bronze Age” of the title refers to both the comics of the 1970s (what some comics historians call the Bronze Age of comics) and to the actual Bronze Age about four thousand years ago. The issue’s main story by Stuart Moore and Alberto Ponticelli begins in New York City in 1975. I remember it being a time of disruption and decay there. I don’t remember the secret super team of Go-Go Golem, Doc Lunar and Madame Ape, but then they were secret. Next we head back to the prehistoric Bronze Age to meet King Domnall Constantine and his daughter Brita Constantina, both fierce warriors taking on a castle full of wizards and their undead army of dinosaurs and other dread creatures. King Domnall speaks as you might expect, but Brita sounds very much like a 1970s teenager. How could that be? One possible reason is the time-traveling chimp she has for a friend, who tells her lots of stories about the future he came from (and apparently can’t get back to). It gets weirder from there, but in a fun way. The backup story by Tyrone Finch and Mauricet is about a bear being used as a test animal for the U.S. space program in 1958. He seems like a very docile and agreeable bear, happy to take a ride into space. What happens next is not unexpected, but entertaining. As always, several interesting text pieces fill out the issue, and fine work is on exhibit from everyone involved, including letterer Rob Steen and colorists Giulia Brusco and Lee Loughridge. This entry was posted in Comics, Reviews on March 26, 2019 by Todd.